Nearly 30 years ago, Kenneth Hartman was sentenced to life without parole for beating a man to death. Hartman has since been shipped between various facilities and watched as the state’s incarcerated population exploded. In Mother California: A Story of Redemption Behind Bars he chronicles his time, his atonement, and the buildings that held him. Below, an excerpt. It is another time of great change in the prison system. The past decade of takeaways has created an increasingly hardened class of prisoners. To combat this growing menace, the system has decided to separate the maximum-security joints into a more dangerous group called 180s on account of the buildings’ floor plans, and a less dangerous group called 270s. (The numbers indicate the field of vision available to the gunner in the central booths; the lower number means he needs to cover a smaller area.) The violence has gotten out of hand. Riots are breaking out. Guards are being attacked. The solution is obviously to turn the screws tighter: this is the only way the prison commanders know. The associate warden who reassured me that no one really does life without parole would be surprised by the officials of classification committees nowadays, who remind us, with relish, how we will indeed spend the rest of our lives in prison, till death do us part. In the past fifteen years, the prison population has doubled and then doubled again. one lieutenant I worked for, a pilot in his off time, once told me he could fly from Los Angeles to Sacramento, a good four hundred miles, by following the lights of the prisons in the Central Valley at night. The crackdown of the ’90s is in full swing. I can stay at Tehachapi if I want, but the prospect of greater restriction isn’t appealing. Besides, there’s the issue of Anita driving up the mountain roads with a new baby. The obvious option is the lone prison in Los Angeles County a 270-maximum in Lancaster. It will shave an hour off her trip. Although leaving any place you’ve known for eleven years is unsettling, it isn’t hard to leave Tehachapi. Unlike Folsom, this is a prison with no hold on my identity. I’ve lived in cells here that no other man has served time in before. I’ve married, made love, conceived a child, but I’ve never felt rooted to the bland, smooth concrete buildings. Even though the mountains rise around the yard and forests are in view, this prison has a featurelessness that sets it apart from the environment. The real world ends definitely at the demarcation line ten yards on the other side of the fences where “no man’s land” begins. Inside this circle of towering chain-link wrapped at the top by a coil of razor wire, punctuated by a menacing, armed obelisk every hundred yards, exists a place out of time. Leaving here will be like leaving nowhere. I remember the first week after I arrived from Folsom. One of the top administrators came down into the dayroom. We were transferred in before the yard was finished, so we were restricted to the little side yards adjoining the buildings, tiny enclosures with twenty feet of naked concrete walls. Everyone was feeling the pent-up frustration of being boxed in. the administrator started off by telling us their plans for the facility – good jobs, vocational training, college, drug counseling. This will be a model institution, he told us. A decade later, after all the shootings, the restrictions on everything from food to exercise to visiting, and the many outrageous abuses, his words leave a bitter taste. I am tired of this place. The day I leave Facility IV-B for Lancaster, I have no lingering sense of loss or regret. Nor do I have any dope shoved inside me, or plans to spread mayhem. All I bring with me, besides my allotted six cubic feet of property, is a growing awareness of the need for a greater dimension to my life, a more significant rationale than a couple of more reps on the iron pile, or another article written. What I don’t have is any feasible outlet for desire. As the bus pulls away, I don’t look back….. The noise is overwhelming, a constant, throbbing, angry cacophony that pours into my cell all day and most of the night. It’s as if the volume knob of the building is stuck at ten and no one knows how to turn it down. Partly, it’s the fault of the physical design, which is set up for the perceived needs of the guards and without any apparent consideration for the two hundred men packed inside. Instead of a solid door, there is a metal screen with hundreds of half-inch holes drilled through. The cell is smaller than Tehachapi’s, but larger than Folsom’s – six feet wide by ten feet deep with two metal racks, two six-cubic-foot metal lockers, a stainless-steel toilet-and-sink combo, and a metal desk and stool affixed to the back wall. There is a large light fixture on the ceiling, with a night-light that’s always on. A four-inch slit of a window runs from about halfway up the back wall almost to the ceiling, right above the desk. The building itself is a large, angular U shape of two tiers, fifty cells on the upper tier and fifty on the lower. In the center of the open space between the arms of the U is the control booth, which sits on top of a ten-foot sally port leading out to the yard. The inside end of this sally port is a large grill gate, and the outside end is a solid metal door. From the ceiling, thirty feet up, hang a couple of dozen yellowish lights and yards of dirty exposed ductwork. This is the new, standard, tilt-up-construction prison building. At this place, there are five of these buildings on each of four facilities: four thousand maximum-security prisoners. (There is also a minimum facility outside the electric fences.) 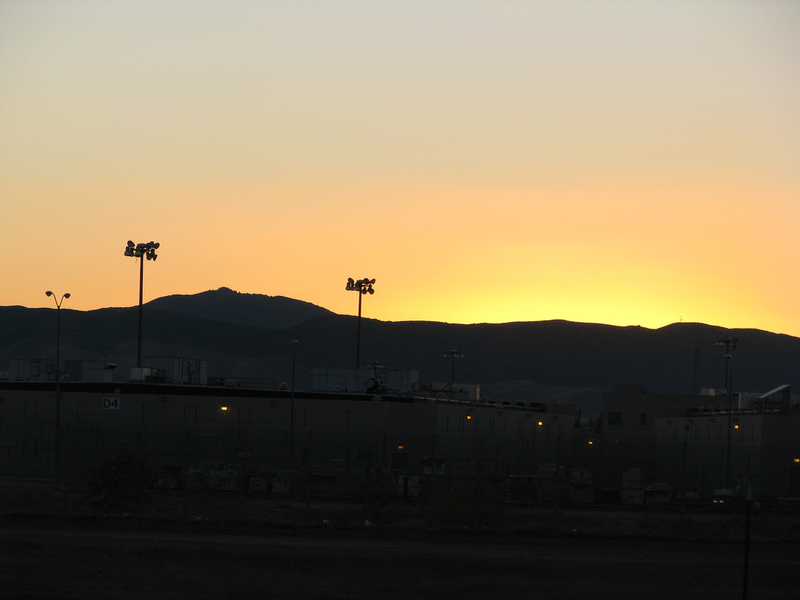 When the California State Prison-Los Angeles County, down in the bowl of a prehistoric lake bed sandblasted by the dreaded Santa Ana winds, opened in 1993, it was under the pretense of a calculated fiction. These cells are the minimum recommended size for one person. The entire infrastructure assumed one man per cell. Of course, two racks were welded in before a single prisoner even set foot in any cell. Two hundred men in a building designed for half as many and four thousand in a prison designed for two thousand means the level of tension is not merely doubled, but it is an entire order of magnitude greater, following basic laws of human nature. It also means the guards are overwhelmed. Here, the response has been abdication. In a sense, it is a return to the Folsom policy of willful neglect. After a decade of hyperaggressive micromanaging at Tehachapi, the unruly nature of Lancaster is unsettling in the extreme. The guards here seem to spend most of their time locked inside the building office, standing in little groups at the corners of the yard, or else they are simply not around. Now and again, I look out across the yard and can’t find a single guard in sight. Even the control tower often appears unmanned, but this is impossible. The effect of this surrender of authority is bedlam.